Let's make this delicious protein-rich grilled tofu recipe which is flavored with sharp and pungent hoisin sauce. If you already have the sauce ready in your kitchen, the remaining process is dead simple. Use extra firm (well pressed) tofu to get the best results. It can be used both as a starter as well as a main course entry. Believe it or not, but I prefer to relish it with brown rice. I've grilled it for a slightly lesser time than normal though you are free to elongate the grilling period. If a regular grill is not available, you use a nonstick grill pan for the same. One can also thread marinated tofu cubes on skewers before grilling. Let's make this mouth-watering grilled tofu preparation in a few easy steps. Do try this simple yet extremely delicious grilled tofu recipe which is flavored with tasty hoisin sauce and is grilled to perfection for a unique texture. Take a bowl and add sesame oil, light soy sauce, rice vinegar, garlic cloves paste, Thai chili sauce, five spice powder, black pepper powder, miso paste, honey and salt in it. Whisk all the ingredients briskly for about 2 minutes to prepare the hoisin sauce. Cut the entire brick into cubes and brush hoisin sauce on all the sides of every cube. Leave some sauce in the bowl. Leave the marinated tofu brick aside for at least an hour. The longer you keep, the better it will be. Preheat your grill on a medium setting. Grill the tofu cubes for about 10 to 15 minutes. Arrange all the grilled cubes in the form of a complete brick. 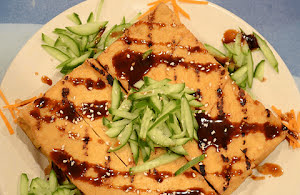 Sprinkle left hoisin sauce on the grilled brick followed by a sprinkle of white sesame seeds. Garnish with carrot and cucumber julienne. Serve hot.